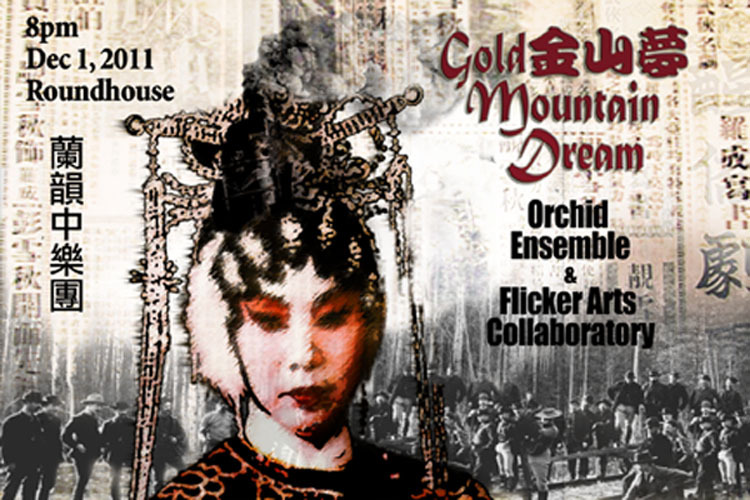 Premiered on December 1, 2011, Gold Mountain Dream explores the themes of diaspora and cultural conflict through interactive media arts, live music, spoken word, and backed by life-stories collected from numerous insightful interviews from different generations of Chinese Canadians. It starts with BC’s Chinese community but expresses a shared experience of all immigrants from different cultures, acting as a bridge between communities. Incorporating Asian traditions with contemporary expression, the Orchid Ensemble combines Chinese traditional musical instruments with western percussion, performing original scores by Canadian composers Jin Zhang, Dorothy Chang, Yawen Wang, Mark Armanini, and Michael Vincent. Spoken words sampled from the interviews are used to form a non-linear narrative. The root of this project started with a collaboration with composer Yawen Wang in a CBC/BBC commissioned radio play on Chinese Diaspora in 2003. Her electroacoustic work Della’s Different Trains, inspired by Steve Reich’s Different Trains, has Cantonese opera singer Della Tse’s voices riding on a number of train sounds recorded across Canada. musicians: Lan Tung (erhu/Chinese violin & vocals), Yu-Chen Wang (zheng/Chinese zither), and Jonathan Bernard (percussion). Media artists Kenneth Newby and Aleksandra Dulic of Flicker Arts Collaboratory punctuate the space with their interactive multimedia exhibit: a projection of abstract images drawing materials from Chinese calligraphy, brush painting, Chinese dance, Chinese opera, and videos and photos from museum collections. The themes of water and fire represent the duality of ying and yang, the elements in much of the Newby and Dulic’s works. Just like most Canadians, the artists are themselves different generations of immigrants from different lands. In this project, they examine the search for cultural identity and social acceptance in four themes – water, fire, travel, and dream. These themes inspire many layers of meaning to the overall work. Water, which at one time used to cover Vancouver’s Chinatown and was also the only medium to carry immigrants to the “new” country, symbolizes their emergence from a repressed world to a new frontier. Like water, which changes its form in natural cycles, the immigrant communities continue to transform and renew with each generation. The theme of fire takes inspiration from a major fire that burned Nanaimo Chinatown to the ground in 1960. Fire also represents struggle, hardship and the opportunity for regeneration and rebirth. Travel is a familiar reality for the immigrant generation, making it possible for the new Canadians to stay connected with their birth countries. Dream is the world of imagination and creativity, and the link between the past, the present, and the future. Today we are here on this land because we or our ancestors have had the dream!